The TRUGLO Omnia scopes are specifically designed for the AR-15 or similar MSR’s. The TRUGLO Omnia scopes come in a 1-4x option or a 1-6x option. Each Omnia scope is designed with a 30mm, aircraft-grade aluminum tube that is hard-coat anodized for superior weather and corrosion resistance. A 30mm tube may be a little heavier, but the increased amount of light intake is so valuable in both low-light situations and longer distance shooting as well. The TRUGLO Omnia tube is Nitrogen gas-filled for fog-proof construction, and is both water and shock-resistant. TRUGLO uses multi-coated lenses on the Omnia scopes to provide outstanding light intake for clarity of sight picture, while also blocking harmful glare. This system of optical coating has become standard, and any shooter should ensure their optics have these features. This type of multi-coated lenses is most especially beneficial to the shooter during lowlight shooting scenarios. When combined with the larger 30mm tube, the TRUGLO Omnia should give the shooter the extra advantage of sight picture clarity in the worst lighting conditions. The TRUGLO Omnia on an AR-15 during a test shoot (photo from YouTube). When the shooter looks through the Omnia optic they will be treated to the TRUGLO All-Purpose Tactical Reticle (APTR). This illuminated reticle delivers glass-etched T-shaped crosshairs missing the traditional top cross hair to provide a clear and open visual sighting picture. The crosshairs are thick enough to draw the shooter’s eye to center, but thin enough to avoid blocking too much of the sight picture. By using the glass-etched system TRUGLO ensures the shooter will always have a cross hair aiming point even if the illumination fails. This is a huge benefit over non-glass etched reticles and most red dot optics. TRUGLO Omnia scopes use the very common CR2032 battery to illuminate the reticle red, and there are “off” positions between each of the (9) light settings for ease of saving battery life. The TRUGLO Omnia APTR provides a clear sight picture with excellent point shooting and mid-range aiming points. Extending upward from the bottom cross hair is a fine line with (3) sub-tension aiming points. There is a small space between the end of this line and a center cross aiming point. Surrounding the center cross aiming point is a 3/4 circle with small cross hair extensions at the 9, 12, and 3 o’clock positions. The APTR is based upon MOA (Minute of Angle) adjustments, and the Omnia scope is designed to make 1/2 MOA elevation and windage adjustments at 100 yards. As seen above, with a 50-yard zero the APTR provides aiming points out to 600 yards. The APTR is specifically calibrated for the Lake City XM-193 55-grain loads of 5.56mm ammunition, with an optional 168-grain .308 caliber version. Another great feature of the TRUGLO Omnia scopes are the locking turrets. Traditional rifle scope turrets use free turning designs, meaning the shooter can turn the turret in both directions to maximum level. There is no mechanism to prevent the turrets from moving, so there is always a chance if the turret is bumped in its case or in the field the turret will move its adjustment setting. Law enforcement shooters cannot afford to have an errant shot. Locking turrets allow the shooter to dial to the desired elevation and windage setting, and then lock the turrets in place. Once locked, the turrets will not move out of setting until the shooter manually unlocks them for adjustment. When the shooter desires to adjust the turrets, TRUGLO provides a leaf-spring mechanism for a crisp and positive click for each adjustment. TRUGLO Omnia scopes come with the TRUGLO APTUS-M1 cantilever-style scope mount. The APTUS-M1 mount is a perfect combination to the Omnia scopes, and provides dual mounting rings for excellent attachment of the scope under any shooting condition. Using the cantilever-style mount allows shooters to mount the Omnia centered on the rifle’s receiver (for AR-15 rifles), while moving the Omnia forward to allow for greater eye relief which translates to broader field of view (FOV) when shooting both eyes open – the preferred method. Another look at the TRUGLO Omnia during an AR-15 shoot (photo from Youtube). MSRP: $280.00 (1-4x); $369.00 (1-6x). Market prices are about $100 less than MSRP. The TRUGLO Omnia scopes (1x) low-end magnification level is perfect for shooters who are faced with fast-paced, quick decision-making shooting situations most often found in close quarters. At (1x) magnification the shooter is provided a true sight picture as if they were simply examining the target with their own eyes. In other words, (1x) magnification is no magnification. At CQB shooting distances, having a (1x) magnification option is paramount. Shooters need a full field of view (FOV) to not only pick up close targets, but also to be able to quickly align the sights on proper targeting locations. This is why red dot or reflexive optics are so popular for CQB shooting scenarios, and why higher magnification scopes fail to perform well in CQB situations. Red dot optics provide a very quick, and simple targeting point in the (1x), and are perfect for close-in shooting. The FOV at (3x) magnification (perhaps the most common long-range scope minimum magnification) can significantly reduce the ability of the shooter to find the close-in target, let alone properly align the sights and then get off rounds quickly and accurately. Reflex optics can also provide a decent aiming point out to as far as 200 yards, but the aiming point often becomes an “area” shot rather than a precise shot as the dot (even small ones) start to encompass most of the target. Most law enforcement shootings occur at distances of 0-200 yards, so simple red dot optics have been highly popular law enforcement selections. However, there are plenty of times, and circumstances, where more precise shots at distance are required of law enforcement. Targets often range from CQB to mid-range distant in short periods of time. This is true in military, law enforcement, or competition shooting situations. TRUGLO and other scope manufacturers have seized upon these shooting concepts and developed the low-end magnification scopes. These scopes typically start at (1x) or no magnification, and go up to (4x), (6x), and (8x). The benefit of these scopes is the shooter will have a much crisper and positive aiming point on targets reaching out to greater distances, while still having a “reflex” aiming point at the (1x) magnification. These lower-magnification scopes offer a (1x) magnification. However, these lower magnification scopes then go much further in providing an accurate aiming point at mid-range distances. EDITOR’S NOTE: For our purposes we’ll call anything within 50 yards close range. Within 50 yards a law enforcement officer rarely has time to dial-up magnification to engage a lethal threat. Instead, they must be confident to deliver accurate and precise fire immediately. Beyond 50 yards and up to about 200 yards is what we consider mid-range. 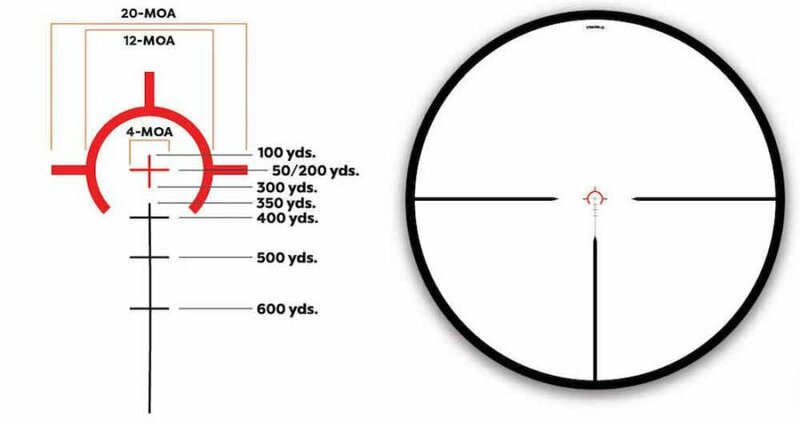 Above 200 yards is most often left to the big boy scopes with magnification of (9x) or greater. A 1-4x scope can accurately place rounds on target at distances from 0-200 yards. 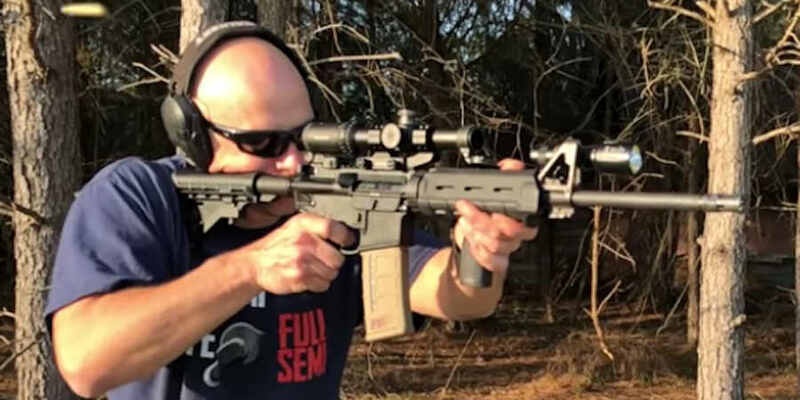 A 1-6x scope can extend that range 300 yards, while a 1-8x scope can provide the shooter an accurate aiming point out to 400 and maybe 500 yards. We have been very pleased with the TRUGLO scopes so far, and the Omnia series appears to be another winner. We have previously written about the TRUBRITE-30 optics in our extensive review of 1-4x optics. We rated the TRUGLO scope to be one of the better options, and the Omnia looks to be even better than the TRUBRITE series. Though we have handled the TRUBRITE scopes, we have not yet had the chance to give the Omnia scopes a close examination. The choice of a rifle optic should be taken very seriously. Excellent rifles can appear awful simply by failing to attach a quality optic. There are many options on the market today. Prices range from just under $100 to well over $2000. Though the more expensive optics come from famously successful optic manufacturers, the most expensive optics may not be the best option. Price does matter! There tends to be several layers of scope quality. The bargain scopes allow novice shooters to hit paper, most of the time. Otherwise they are pretty poor in quality, features, and accuracy. The most expensive scopes provide extremely crisp images, outstanding magnification control, and are packed with features. However, those top-end scopes often exceed a good price-to-value analysis. The mid-range scopes often provide excellent features, decent clarity and accuracy, and several desired features. These mid-range scopes can often compete quite nicely with the more expensive ones, and for far less money. The TRUGLO Omnia scopes appear to be a great selection at very affordable prices.